The Fantastic Paradise turns 50 ! 50 years ago, Niki de Saint Phalle and Jean Tinguely presented their Fantastic Paradise to the public on the occasion of the Universal Expo 1967 in Montreal, Canada. A few weeks after HON’s destruction in August 1966, the two artists envisioned a new gigantic and collective project together. 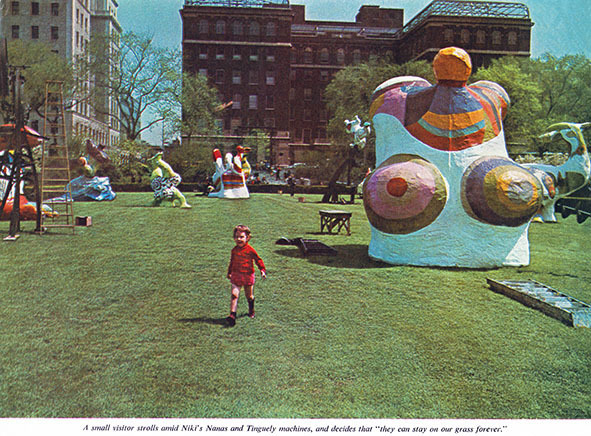 This next sensational sculpture group, called : Le Paradis Fantastique in French and Enchanted Garden or Earthly Paradise in the English press, was proposed by Niki de Saint Phalle herself to the French Government for its Pavilion at the Universal Expo, which started end of April 1967. Finally on January 6th, 1967 Niki de Saint Phalle and Jean Tinguely met with Robert Bordaz, Director of the French Pavilion and unveiled the project model. [drawing for Le Paradis Fantastique] , 1967 – Collection Albright-Knox Art Gallery, Buffalo, New York © 2017 Niki Charitable Art Foundation, All rights reserved. The theme of the Fantastic Paradise was “Life confronted with the forces of Destruction”. Jean Tinguely’s black and sharp machines symbolically attacked the round and colorful sculptures of Niki de Saint Phalle. The Director was very interested and agreed to showing it. However, he warned the artists that the budget would be tight. During this meeting they made the decision to exhibit the work in open air, on the terrace of the 7th floor of the futuristic building designated by Jean Forgeron. rehabilitation! Finally we are no longer cursed. In a Parisian workshop in the neighborhood of les Buttes-Chaumont, Niki de Saint Phalle used 300 cubic meters of expanded polystyrene, 2 tons of polyester and 5 miles of fiber glass to give life to 9 gentle monsters, Nana-flowers and other imaginary creatures ranging in height from 10 to over 20 feet. coated with polyester and painted, once they have been carved. 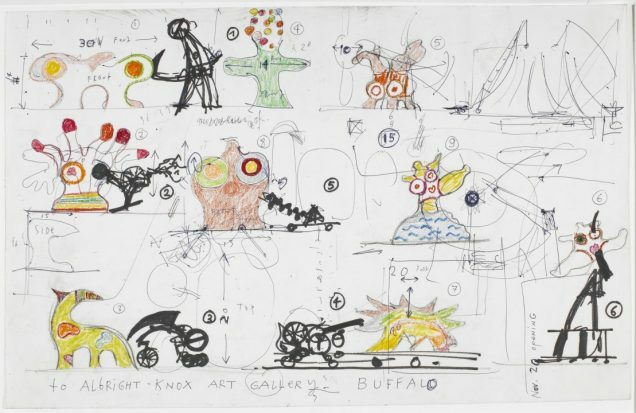 In the meantime Jean Tinguely was producing 6 machines that “threatened” Niki’s whimsical sculptures. At the end of March 1967 the 15 sculptures were ready to be packed and transported on board a cargo plane chartered by the French army. Exhausted from frantic work, Niki lost 15 pounds and had to be hospitalized for pneumonia at the American Hospital in Neuilly. Even before the inauguration of the Expo67, the International Press was unanimous: endorsing Saint Phalle & Tinguely to represent the French avant-garde at an event of such a magnitude was a bold gesture. is she will be the find of the Expo 67. Once the works were revealed on April 28th, some critics were enthusiastic and … others outraged. are almost raped by the atrocious machines of Tinguely. Phalle. It’s Expo’s single most impressive sculpture exhibit. When Expo67 came to an end in October, the Fantastic Paradise was dismantled. 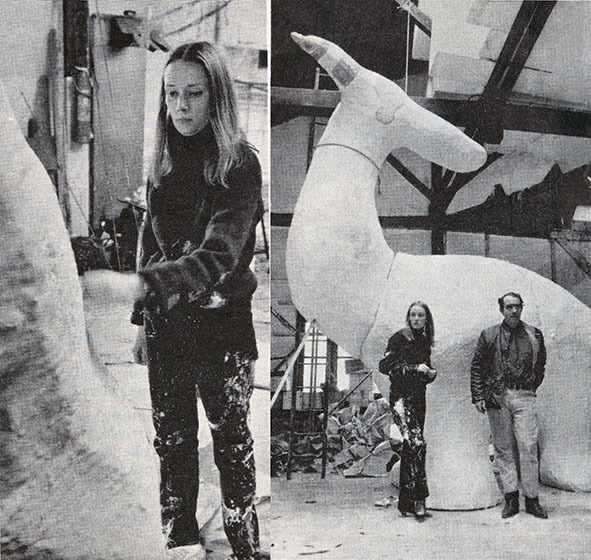 Niki’s sculptures were cut into pieces to travel by truck and be exhibited at the Albright-Knox Art Gallery in Buffalo, New York. The artists had to restore the work but their “fight in paradise” received a much warmer welcome in the press and in the public than in Canada. you over, delight, amuse and beguile you. After Buffalo, the Fantastic Paradise was moved to the Conservatory Garden Lawn, in Central Park, NYC for one year. Over there, too, the public reaction was very favorable. At the end of its journey, the question arose about the future of the sculpture group. Pontus Hulten, Director of Moderna Museet in Stockholm, accomplice and longtime friend of the artists offered a solution. He asked them to donate the whole set to the Moderna Museet in exchange of its life-long conservancy and display in the Swedish Capital. Jean and Dominique de Menil, collectors and friends, generously financed its return in Europe. Since its creation in 1967 Niki de Saint Phalle repainted the Fantastic Paradise but the provoking sculpture can still be enjoyed everyday, outside, on Skeppsholmen an island in central Stockholm. The Fantastic Paradise in Stockholm – photograph Albin Dahlström / Moderna Museet – © 2017 Niki Charitable Art Foundation, All rights reserved.